The song almost romanticizes the job, but in fact, it can be quite dangerous. Just ask Kevin Shaffer, a lineman for Rural Electric Cooperative (REC), a power company serving south-central Oklahoma. Check out the photo: Shaffer was in the raised bucket when a fire engulfed his truck. In this instance, technology came to the rescue. 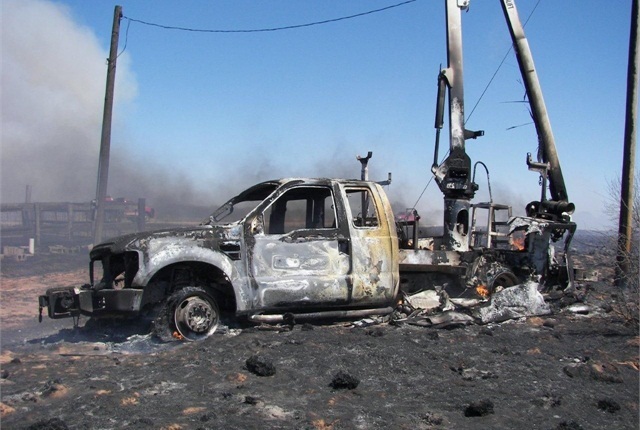 A lineman for a power company in Oklahoma was in the bucket of this truck when it caught fire. He used a key fob "panic button" to alert authorities to the emergency and evacuated safely. Mitch Gilreath, IT specialist for REC, is well aware of the dangers of line work. Linemen must be protected from electrocution, and they sometimes need to collect bad debt from customers — who might also have a bad dog. Gilreath brings up the time when a lineman drilled a hole through the wooden pole and into his hand. “Those are some of the dangers,” he says. For this reason, he wanted a way for a lineman to call for help should an emergency situation arise. He was thinking of a panic button, which isn’t a standard product. Nonetheless, Gilreath made it part of the conversation with different telematics providers before the company decided on a system to deploy in its fleet. One telematics system provider, GPS Insight, told Gilreath it could create one. The device, on a key fob, was specifically designed to operate independently of the vehicles. The company went with the system and each lineman was assigned a fob. Shaffer hit the panic button and started to bring the bucket down. His hydraulics failed, but the battery-operated backup kicked in and he was able to remove himself to safety. His cell phone was in the cab, engulfed in flames. Nonetheless, pressing the panic button alerted dispatch to the emergency while the telematics system identified his exact location. After Shaffer’s accident, “They came around,” Gilreath says. Back when Webb wrote the song in the late ‘60s, Shaffer might not have made it down, let alone have been able to call for help. Even today, line work ranks in the top 10 most dangerous professions based on annual fatalities. It’s nice to long for the good old days, but we should be grateful that technology has provided us with more tools to make our jobs safer.